Our legs are weight-bearing limbs and include large and important muscle groups. The hip bones discussed in the article "The Bones of the Pelvis" are part of the appendicular skeleton and create a transition point between the axial skeleton of the upper body and the appendicular skeleton of the lower limbs (the bones of the arms are also part of the appendicular skeleton). The bones of the lower limb include the femur, patella, tibia, and fibula. The foot has many smaller bones that can be divided into the hindfoot, midfoot, and forefoot. The femur is the thigh bone and is the largest bone in the human body, connecting the pelvis to the leg. It inserts in the acetabulum of the pelvis bone to create a ball-and-socket type of joint. This type of joint has a wide range of motion. At the distal end of the femur, it connects to the tibia and patella to form the knee joint. A broken femur requires a huge amount of force and is considered a medical emergency due to the proximity of the femoral artery that travels very close to the femur bone, and could be severed by the sharp edges of the broken bone or bone fragments. At the distal end of the femur from the pelvis, is the knee joint where the patella or kneecap is located. 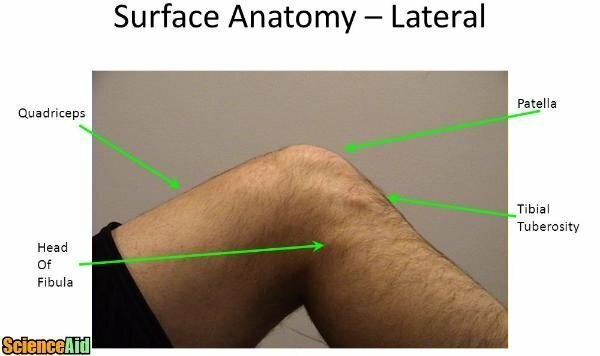 The patella is a sesamoid bone and helps the very large and powerful muscles of the thigh, called the quadriceps to travel over the knee with minimal friction via the patellar tendon. The patella can become dislocated, which often requires medical attention in order to put it back into place but can also relocate on its own. The tibia is the first of the two bones of the lower leg and is located medially to the fibula (on the inside of the leg). This is the bone you feel when you touch your shin at the front of your lower leg. It is also the bone that we rest on when we are kneeling. When we kneel, we are actually placing our weight on the tibial tuberosity and not the kneecap. The tibia articulates with the femur and the patella at the proximate end to form the knee joint as well as with the ankle bones at the distal end. 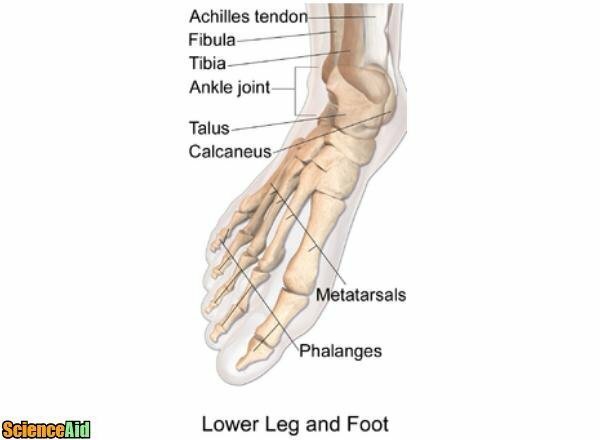 The fibula is the second, smaller bone of the lower leg. It runs parallel to the tibia on the lateral side (the outside) of the leg. The fibula is what you feel when you touch the protruding bony landmark, called the lateral malleolus, on the outside of your ankle. 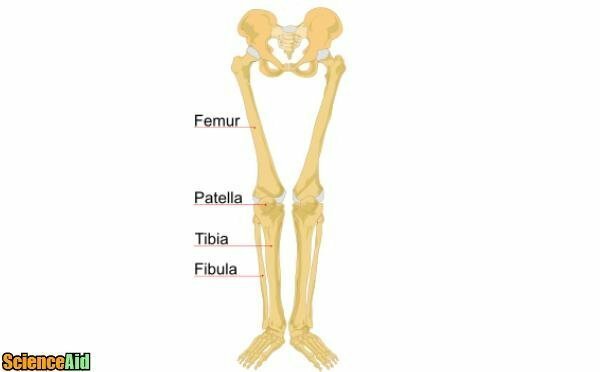 You can also see the head of the fibula to the outside of the knee but otherwise, you cannot feel this bone in your lower leg. The hindfoot includes the ankle bone, called the talus, which creates a joint that is important for balance and walking. The talus articulates proximally with the tibia and fibula above it as well as distally with the foot bones below it to form the ankle joint. The hindfoot also includes the heel bone, called the calcaneus. The calcaneus sits directly underneath the talus bone. It is the largest bone in the foot as it needs to be quite sturdy in order to withstand the weight of our body when we walk or stand. 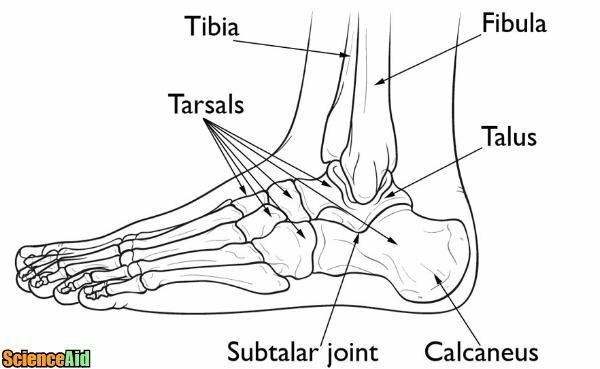 The talus and calcaneus are both parts of a group of bones called the tarsal bones in addition to the bones of the midfoot. The midfoot is comprised of a group of bones called tarsal bones (in addition to the tarsal bones of the hindfoot - the calcaneus and talus). 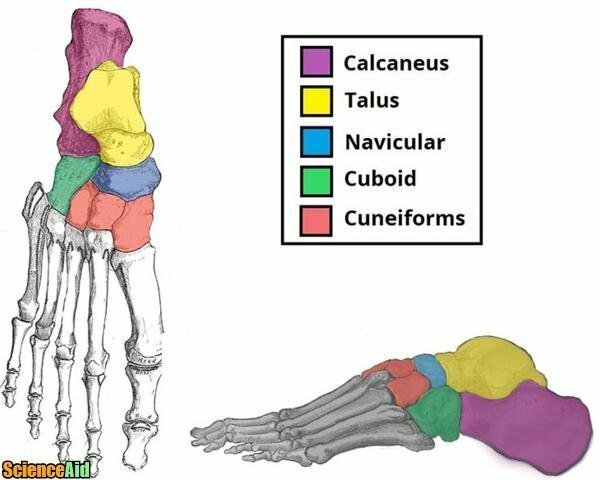 This includes the cuboid bone, navicular bone, and three cuneiform bones. These help to create the arch of the foot along with important muscles and ligaments in the bottom of the foot. The bones in the forefoot are small and delicate and are similar in structure to the bones in the hand. This includes five metatarsal bones (one for each toe) and fourteen phalanges bones. The phalanges are the bones of the toe; each toe has three phalanges except for the big toe which only has two phalanges. It is easy to feel the metatarsals and phalanges by touching the top of your foot. You can also see the tendons on the top of the foot that attach to muscles that move the foot. MLA (Modern Language Association) "Bones_of_the_Human_Leg_and_Foot." ScienceAid, scienceaid.net/Bones_of_the_Human_Leg_and_Foot Accessed 23 Apr 2019. Chicago / Turabian ScienceAid.net. "Bones_of_the_Human_Leg_and_Foot." Accessed Apr 23, 2019. https://scienceaid.net/Bones_of_the_Human_Leg_and_Foot. Thanks to all authors for creating a page that has been read 8,446 times.